Another old transfered ship for P & O Australia ! 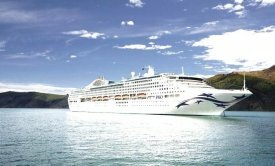 Joining the P & O Australian Cruises fleet in 2017 is the present 1997 built 77,000 grt Princess Cruises ship ' Dawn Princess ' which is now one of the oldest Princess Cruises ships still in operation and at present cruising from Australia. This ship will be repainted and renamed ' Pacific Explorer ' and have the ' Southern Cross ' added as a hull decoration ! Once again P & O Australia will get a 20 year old cruise ship to join their fleet which now has the very much newer RCI Cruises ships operating in the same areas and offering much better value and facilities for passengers on their cruise ships ! As a Carnival Group shareholder I do not like the way the group treat the Australian and New Zealand area passengers by just providing old secondhand ships for cruises and now also cancelling what was to have been a brand new cruise ship for this area ! This new cruise ship they are now retaining for use in the US market area and instead are sending P & O Australia another of their own old ships which has in the past had many mechanical problems ! Many of my friends in this area no longer cruise with P & O Australia as they do not like the old second hand rust buckets they are now operating with some of them not even having a fridge in the cabins ! Artists picture of the repainted ship attached !